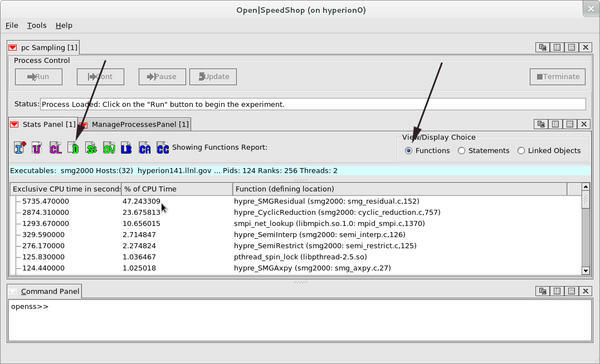 Open|SpeedShop is an open source multiplatform Linux performance tool targeted at performance analysis of applications running on both a single-node and on large-scale platforms. 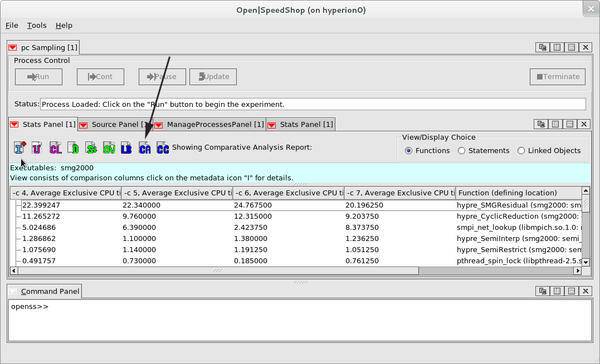 Open|SpeedShop is an open source multiplatform Linux performance tool targeted at performance analysis of applications running on both a single node and on large-scale IA64, IA32, EM64T, AMD64, IBM Power PC, Cray, and IBM Blue Gene platforms. 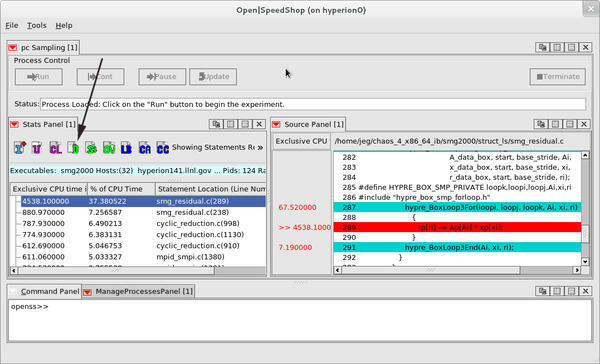 Open|SpeedShop operates on existing application binaries, so there is no need to recompile the application being analyzed. Open|SpeedShop gathers several types of performance information, relates that information back to the application source code, and then displays the associated performance information to the user. Open|SpeedShop is in use at a number of laboratories, universities, and corporations worldwide, helping software developers and users speed up applications and reduce time to solution. Open|SpeedShop supports performance analysis of sequential, MPI, openMP, and threaded applications and has been tested on several of the most common Linux distributions with the most commonly used MPI implementations, including SGI MPT, mpich2 variants, mvapich, mvapich2, and openmpi. In this article, I will describe how to use Open|SpeedShop through step-by-step examples illustrating how to find a number of different performance bottlenecks. Additionally, I will describe the tool’s most common usage model (workflow) and provide several performance data viewing options. Open|SpeedShop uses both statistical sampling and traditional tracing techniques to record performance information. The central concept in its workflow is an experiment. An experiment defines what type of performance information is being measured and the program being analyzed. Users select their experiment at the beginning of any performance analysis run depending on what kind of performance bottleneck they would like to investigate. The main types of data gathered via sampling techniques – by periodically interrupting execution, recording location, then reporting statistical distribution across all reported locations – are program counter information (pcsamp; experiment names are in parentheses; for example, “pcsamp” is the name of the Program Counter Sampling experiment), call path information (usertime), and hardware counter information (hwc, hwctime, hwcsamp). Tracing techniques are used to gather Input/Output information (io, iot), MPI function-specific information (mpi, mpit, mpiotf), and Floating Point Exception information (fpe). (Tracing techniques involve gathering and storing individual application events – e.g., function invocations, MPI messages, I/O calls. Events are typically time stamped and provide detailed per event information.) Table 1 describes specific performance issues that each Open|SpeedShop experiment is designed to reveal. pcsamp High user CPU time. Gives good low-overhead overview of performance. Actual CPU time at the source line, machine instruction, and function levels by sampling the program counter at 100 samples per second. usertime Slow program, nothing else known. May not be CPU-bound. Inclusive and exclusive CPU time for each function by sampling the callstack at 35-sample-per-second intervals. Identifies paths through the program that are taking the most time. hwc High user CPU time Counts at the source line, machine instruction, and function levels of various hardware events, including: clock cycles, graduated instructions, primary instruction cache misses, secondary instruction cache misses, primary data cache misses, secondary data cache misses, translation lookaside buffer (TLB) misses, and graduated floating-point instructions. A single hardware counter is read when a predefined count threshold is reached (overflows). hwcsamp High user CPU time Similar to hwc experiment, except that periodic sampling is used instead of the overflow mechanism. Up to six (6) hardware counter events are read when a sample is taken. hwctime High user CPU time Similar to hwc experiment, except that callstack sampling is used and call paths are available along with the event counts. io I/O-bound Traces and times the following I/O system calls: read, readv, write, writev, open, close, dup, pipe, creat. The time reported is wall clock time. Call path information also is available. iot I/O-bound Traces and times the following I/O system calls: read, readv, write, writev, open, close, dup, pipe, creat. The time reported is wall clock time. Output is a line of trace per I/O function call. Call path information also is available. mpi MPI performance is poor. Times calls to various MPI routines. The time reported is wall clock time. Call path information also is available. mpit MPI performance is poor. Traces and times MPI function calls. Output is optionally a line of trace per MPI function call. All calls are accounted for by wrapping, (i.e., no sampling). The time reported is wall clock time. mpiotf MPI performance is poor, and OTF files are preferred. Traces and times MPI function calls and generates Open Trace Format (OTF) files using VampirTrace as the underlying gathering tool. fpe High system time. Presence of floating point operations All floating-point exceptions, with the exception type and the callstack at the time of the exception. After collecting performance information, Open|SpeedShop displays it in detailed reports that allow the user to relate the performance information back to its application source code easily. This information is accessible through a comprehensive graphical user interface (GUI), from a command line interface (CLI), as well as from within Python scripts. Additionally, the toolset includes a series of analysis techniques, including outlier detection, load balance analysis, and cross-experiment comparisons. Open|SpeedShop’s functionality provides a comprehensive set of techniques that greatly aids analysis and understanding of parallel application performance. The Open|SpeedShop website describes the usage and meaning of these environment variables in detail (BuildAndInstallGuide). The workflow model for running Open|SpeedShop on a desktop or cluster system entails a command to gather the data and create an Open|SpeedShop database file containing the performance information and application symbol information. The Open|SpeedShop GUI or the interactive CLI tool enable viewing the data contained in the database file. Each of the above-mentioned experiments has a corresponding convenience command – for example, osspcsamp for the pcsamp experiment, ossusertime for the usertime experiment, and so on. I use the application smg2000 – a Semicoarsening Multigrid Solver based on the hypre library and taken from the ASCI Purple benchmark suite – for examples in this article. osspcsamp "mpirun –np 256 smg2000 –n 65 65 65"
osspcsamp "srun -ppbatch -N 32 -n 256 ./smg2000 -n 90 90 90"
When executing the above commands, one sees output from Open|SpeedShop and from the application and then the default performance analysis report showing the functions in the application that took the most time. Additionally, an Open|SpeedShop database file is created. This SQLite database file contains the performance information for smg2000 and the debug symbol table information, including source line number information. That enables the file to be moved to any other platform/laptop that has Open|SpeedShop installed for viewing, if desired. osspcsamp "srun -ppbatch -N 32 -n 256 ./smg2000 -n 90 90 90"
[openss]: pcsamp experiment using the pcsamp experiment default sampling rate: "100". "srun -ppbatch -N 32 -n 256 /home/jeg/chaos_4_x86_64_ib/opt/OSS-mrnet/bin/ossrun -c pcsamp ./smg2000 -n 90 90 90"
the GUI is raised and displays the program counter sampling experiment default view as shown in Figure 1. Note that the naming convention for Open|SpeedShop database files uses the .openss suffix. Figure 1: Default GUI program counter sampling view. By choosing the Statements as the View/Display Choice on the right side of the GUI Stats Panel window and then clicking on the D icon, which represents the default view selection, one can view which statements in smg2000 took the most time (Figure 2). By double-clicking on a line of performance information in the Stats Panel, the Source Panel is raised and focuses on the line in the application source code that corresponds to the performance information. With this feature, one can quickly see where in the application source the performance issue shows up. Figure 2: Statement view with Source Panel. In the load balance view (Figure 3), one can look across all ranks included in the application execution at statement-level granularity. To generate this view, select Statements as the View/Display Choice and then click on the LB load balance icon. The information displayed is the minimum, maximum, and average exclusive time recorded for each statement in the program across all ranks, threads, or processes. In this case, a user sees rank information because this is an MPI application run. Additionally, this view displays rank number of the minimum and maximum values to help focus in on any possible outliers (a rank, thread, or process that is performing outside of the majority of the other ranks, threads, or processes). Use this view to determine whether there is imbalance or not. If the minimum and maximum values for key functions, statements, or libraries vary by a significant amount, then the application run is likely not well balanced. Figure 3: Program counter sampling load balance view. If imbalance is suspected, the comparative analysis CA icon can be selected to run a cluster analysis algorithm on the performance information. In general, the cluster analysis algorithm will group processes, threads, or ranks together into groups of like-performing entities, thus exposing the ranks, threads, or processes that are not performing the way the other groups are. Each group is displayed as a column in the comparative analysis view (Figure 4). This view depicts which ranks are in the outlier group(s) and examines their performance information individually or as a group with the other Open|SpeedShop views. Figure 4: Program counter sampling comparative analysis view. The previous example showed how Open|SpeedShop can identify performance issues using the lightweight program counter (pcsamp) experiment to obtain an overview of the performance of an application across all its ranks, threads, or processes. This is a good starting point, but program counter sampling does not give calling context. That is, it is missing information about time spent along call paths through the application and also the function caller–callee relationship information. ossusertime "srun -ppbatch -N 32 -n 256 ./smg2000 -n 90 90 90"
will open the Open|SpeedShop CLI and load in the performance data associated with the named database file, making it available to view. command. This command tells the CLI to display the five top time-consuming unique call paths in the application. The fullstack option tells the CLI to display the entire individual call path, even if the display of that particular call path matched portions of another call path. Without the fullstack option, the call path display would compress the call path view. All call paths can be examined in the GUI, if desired, by selecting the C+ icon. Figure 5: Call path (usertime) hot call paths view. hwc (osshwc), which allows the user to specify one hardware counter event and then tracks all occurrences based on a threshold value and maps that information back to the source code statements where the hardware counter events occurred. hwctime (osshwctime), which provides the same information as the hwc experiment, but also provides function-level call path information, giving the calling context and events along call paths in the application being monitored. hwcsamp (osshwcsamp), which uses a timer-based sampling mechanism to periodically read up to six hardware counter values during the experiment execution. This experiment provides a good overview of how often the hardware counter events the user specified are occurring. Mapping where the events occurred is not as accurate as the hwc and hwctime experiments. With this performance data, I can tell that line 289 in the file smg_residual.c has the most level 1 cache misses in the smg2000 application. Frequently, users will run more than one hwc, hwctime, or hwcsamp experiment and then use the information from multiple experiments to calculate ratios and other statistics to help understand the performance issues at the source lines that Open|SpeedShop points them to. For example, running another hwc experiment, this time using PAPI_L1_DCA (level 1 data cache accesses), would allow the calculation of the ratio of level 1 data cache misses to accesses, which could be used find source lines that are performing badly because of excessive cache misses. 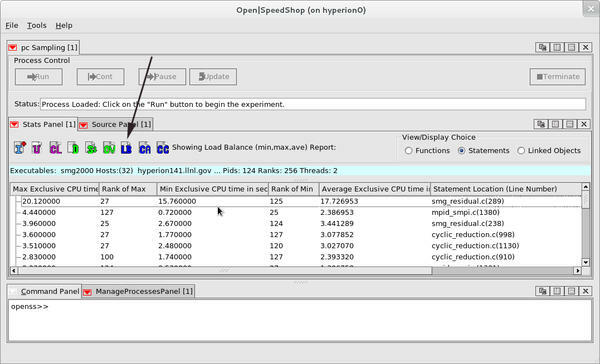 ossiot "mpirun –np 2 ./sweep3d.mpi"
In Figure 6, I present an example of the event-by-event list view using the GUI, when the Event List EL icon is selected. A chronological list of all the Input/Output function calls, with the argument values and function-dependent return values, is displayed in this view. Figure 6: Input/output event list view. As with any of the experiments that span multiple processes, threads, or MPI ranks, Open|SpeedShop allows the user to focus on any individual process, thread, or MPI rank and allows the user to show the load balance across the experiment and do cluster analysis to find the outliers. mpi (ossmpi), intercepts each MPI function call, recording the number of calls to each function, the time spent in each call, and the call path information, which describes the call path to each of the MPI function calls. 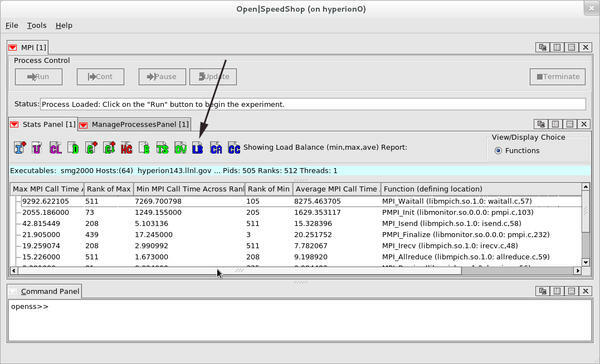 mpit (ossmpit), provides the same information as the mpi experiment, but also provides the parameter values for each MPI function call made in the application being monitored. mpiotf (ossmpiotf), uses VampirTrace under the hood and creates Open Trace Format (OTF) files, which can be displayed with other tools, most notably, Vampir (Vampir: Performance Optimization). The VampirTrace library allows MPI communication events of a parallel program to be recorded as a trace file. This method could be useful because the gathering of tracing performance data creates large database files and slows viewing considerably. This also is true for the I/O experiments. ossmpi "srun -ppbatch -N 64 -n 512 ./smg2000 -n 90 90 90"
instructs the CLI to display the top time-consuming unique call path involving the function MPI_Waitall. This technique might be useful when one is focusing on an individual MPI function because it eliminates excess call path displays. A graphical view (Figure 7) of the load balance across the 512 ranks of the smg2000 application run, from the same database file used above, shows the minimum, maximum, and average values for the time spent inside the MPI functions that were called during this application’s execution. The rank numbers of the minimum and maximum values are also displayed. As with all experiments that have multiple processes, threads, or ranks, selecting the LB icon generates the load balance view. Figure 7: MPI experiment load balance view. ossfpe "mpirun -np 2 ./smg2000 -n 10 10 10"
osspcsamp "mpirun –np 256 ./my_appl"
time in seconds. time in seconds. There are several alternative comparison options for the osscompare command. Please see the man page for osscompare for the details. Open|SpeedShop is built from a source tarball that can be downloaded from SourceForge. This tarball contains the Open|SpeedShop source and the source of several other open source components that are an integral part of Open|SpeedShop. At the top level of the build directory is a bash script named install.sh. A few key environment variables need to be set: one to tell the script where to install (OPENSS_PREFIX) and others to specify MPI installations as desired. If you do not set the key environment variables and execute the script, the script stops and asks you to set them. The script also checks to see if the required system-level development packages are installed, outputs warning messages, and asks a user to update if needed. If all system-level development packages are installed and the install location environment variable (OPENSS_PREFIX) is set, the script will build and install the source tarballs Open|SpeedShop requires. It then will build and install Open|SpeedShop. After the build and install is complete, the run-time environment must be loaded to execute the tool. Most sites use module, Dotkit, or SoftEnv files to set up the PATH, LD_LIBRARY_PATH, and Open|SpeedShop-specific environment variables. Examples of each type of file are on the Open|SpeedShop website under the Build Information section. Users who have access to any of the systems under the Available Installations section of the Open|SpeedShop website might be able to use Open|SpeedShop without building their own version. Clean Linux distributions that are not set up for software development require some system-level development packages to be installed. The list of packages required is provided in the Build Information section on the Open|SpeedShop website. The workflow for using Open|SpeedShop on static applications on the Cray and Blue Gene platforms differs from that described in the sections above. This web page for the NERSC Cray Open|SpeedShop installation and usage explains those differences. In this article, I outlined potential uses of Open|SpeedShop to find performance issues in sequential and parallel applications running on Linux clusters, as well as the Cray and Blue Gene platforms. The scenarios shown in this article can be supplemented by viewing the recent Open|SpeedShop tutorials and presentations found on the Open|SpeedShop website. In particular, the SciDAC 2011 and SuperComputing 2011 tutorials have extensive example usage scenarios that could be helpful. Developers using a hybrid (MPI and OpenMP) programming model might find this Open|SpeedShop hybrid performance analysis tutorial useful. There are a number of ways to receive help with building and using Open|SpeedShop. One option is the Open|SpeedShop Forum, where users can ask questions and view previous questions and answers. Another option is to send email to the alias oss-questions@openspeedshop.org. You also may email the author directly. The latest release is version 2.0.1 and is available for download on SourceForge at this location. Documentation is available in the form of man pages when Open|SpeedShop is installed, a downloadable version of the Open|SpeedShop Quick Start Guide, and a number of user guide documents that can be found on the Open|SpeedShop Documentation web page. Jim Galarowicz is a Senior Computer Scientist at the Krell Institute and a full-time developer of Open|SpeedShop. I thank the Open|SpeedShop team: Donald Maghrak, full-time developer; William Hachfeld, David Whitney, and Dane Gardner, part-time developers; and John Ziebarth, project manager, all of the Krell Institute, as well as project partners Martin Schulz (Lawrence Livermore), Dave Montoya (Los Alamos National Laboratory), and Mahesh Rajan (Sandia). I also thank Bill Cannon and Tom O’Donnell of the Krell Institute for reviewing this article before publication.